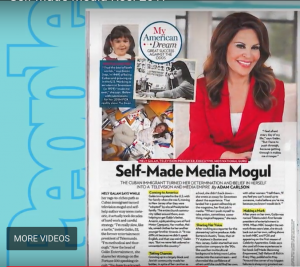 As a Latina and a self-made media mogul who has produced hundreds of television shows, headed a TV network, and generated a significant amount of income, Nely Galán ironically felt an odd sense of relief when the economy crashed in 2008, bringing many of her projects to a halt. In hindsight, Galán believes she had been feeling incongruent in her career because she was in a field where much of the focus was on achieving success, and where individuals were not valued for being their authentic selves. By that point in her life, she had been through psychotherapy and understood how powerful it could be. After going back to school to complete a Ph.D. in Clinical Psychology with an emphasis on depth psychology, Galán realized the extent to which depth psychology provides a powerful lens for introspection and for examining ideas about diversity. The data that Galán collected from those conversations ultimately formed the basis of her New York Times best-selling book, Self Made: Becoming Empowered, Self Reliant, and Rich in Every Way. The book offers advice, grounded in cognitive behavioral therapy, about finding happiness in many aspects of life—not just economically, but also in areas like family, love, and spirituality.